The current issue of Sound Consumer includes a feature by Ariana Taylor-Stanley on Washington’s organic dairies using robots in the milking parlor. Read the excerpt below or the entire article here. Robotic milking machines might sound like they belong on industrialized megafarms, but the first dairy in Washington to bring robots into the milking parlor was a family-run organic farm. So was the second. 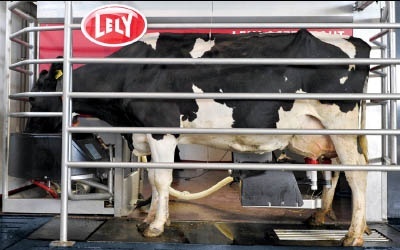 In fact, according to Aaron Johnson of Excel Dairy, of the six Washington dairy farms to install robotic milking machines so far, five are organic. As sustainable dairies turn to robotic systems, the robots are helping them to become more sustainable businesses. The Styger Family Dairy Farm in Chehalis, which sells organic milk from its 90 cows through the Organic Valley co-op, was the first farm in the state to install a robotic milking machine system. Owners Linda and Andy Styger are nearing retirement age and none of their grown children plan to take over the farm. “The robots give us the chance to be sustainable for at least 10 more years,” Linda Styger explains. She hopes by then her grandchildren will be ready to take over the farm. The robots will make it “easier for a family member to take over and have a better quality of life,” says Styger. “Someday we hope to make that transition for the fourth generation.